UCLA Health uses 7.1 million pounds of linen per year. Processing that much linen uses 8,132,336 gallons of water and 308,173 kWh of electricity - that is enough to fill 12 Olympic-sized pools and power 33 homes for one year. In keeping with our commitment to sustainability, linen is being changed when needed or requested in patient care areas. A new bed-making policy was also implemented to further reduce our utilization of linen. This new process will help conserve water, decrease the use of chemicals when linen is laundered, and reduce energy consumption and cost. 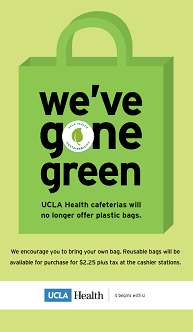 UCLA Health has been making the shift from disposalbe to reusable products because they are less detrimental to the environment. One change that has occured is the use of precaution gowns that can be washed and reused. In May 2012, the laundry and linen department introduced reusable precaution gowns on a unit-by-unit basis. To date, 60 percent of the units at the Ronald Reagan UCLA Medical Center have switched from disposable to reusable gowns. Every time a gown is washed and reused, it keeps a disposable gown out of the landfill. A total of 605,795 reusable gowns have been used, keeping 108,900 pounds of trash out of the landfill. Americans consume 100 billion cups of coffee yearly and over 16 billion of those coffees are bought in disposable paper cups. This adds a tremendous amount of waste to the landfills. By switching to reusable coffee mugs, you are reducing the environmental impact of your daily cup of Joe. U-Mugs, available for $5.25 at Ronald Reagan UCLA Medical Center Dining Commons, Café Med, and UCLA Medical Center, Santa Monica Cafeteria. 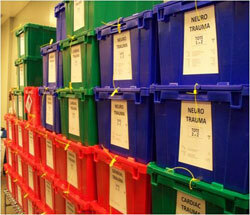 Many of the medical center's deliveries are carried in reusable plastic totes. The distributor will remove products usually from cardboard boxes and places them in reusable totes which are delivered to the medical center. The totes are sent to the floors and once emptied are returned to the distributor to repeat the process. The cardboard that would end up in the medical center's waste stream never does and is recycled by the distributor. UCLA Health has a program to reuse sharps containers (medical waste disposal containers). While the hazardous waste is sterilized and incinerated, the container itself goes through a regulated process of sterilization, reassembly and is then returned to the health system. 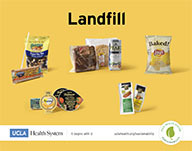 Reusing biohazard containers eliminates 40 to 60 tons of UCLA waste from being added to landfills. 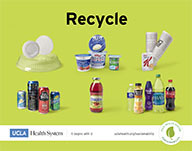 Staff and visitors have the opportunity to place recyclables in bins located inside and outside of our dining facilities. 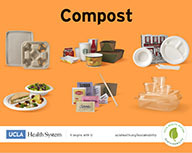 We also collect food and compostable service ware that is sent to a compost facility. The organic material decomposes under special conditions and serves as fertilizer for agricultural purposes closing the loop on food waste. We kept 156,000 lbs. of food waste from going to the landfill in fiscal year 2012-2013. There are signs indicating which items go in each bin. In an effort to reduce the amount of plastics that litter our streets, highways, landfills, and oceans, we no longer offer single-use plastic bags in the cafeterias. Each year approximately six billion single-use plastic carryout bags are consumed in the County of Los Angeles, the equivalent of 600 bags per person per year. Less than 5% of those bags are recycled. We encourage all of our staff to bring their own bag if they anticipate buying several items. Q: How much are the reusable bags? Answer: Reusable "U" bags can be purchased for $2.25 plus tax at the cashier stations in the cafeterias. Q: What are the bags made of? Answer: Laminated woven polypropylene (#5 plastic). Q: Are the bags washable? Answer: It is recommended that the bags be wiped clean rather than placed in a washing machine. Q: Do the bags contain recycled material? Answer: The bags are made from 20% pre-consumer recycled content. Q: Are the bags recyclable? Answer: Yes, the bags are recyclable. Check with your local recycler. Q: What are the dimensions of the bags? Answer: 13"W x 15"H x 10"D. The bags were custom-made to fit the large plates.